For full details, see the release notes or skip straight to the download page. Much of the security community has missed the Full Disclosure Mailing List since it abruptly shut down on March 19, so we've decided to reboot it for a fresh start! You can subscribe to the new list here. The Nmap Project is pleased to release our new and improved Icons of the Web project! We scanned the Internet's top million web sites and created an interactive 5-gigapixel collage of the results. You can explore it with our online viewer including pan/zoom and search capabilities to find your favorite sites. Nmap 6.40 is now available with with 14 new NSE scripts and hundreds of new OS and version detection signatures. It also includes great new features such as Lua integration for scripting Ncat, and initial support for NSE and version scanning through a chain of proxies, improved target specification. Of course there are many performance enhancements and bug fixes too! You can read the full details or download it free here. We're proud to release Nmap 6.25 with hundreds of improvements, including 85 new Nmap Scripting Engine scripts, Nearly 1,000 new fingerprints for OS detection and service/application version detection, and Performance enhancements such as the new kqueue and poll I/O engines. 3,000 people participated in the latest top security tools survey and we have relaunched SecTools.Org with the new data! We have also dramatically improved the site—it now allows user ratings and reviews, tracks release dates, offers searching and sorting, and allows you to suggest your own favorite tools. Are you familiar with all of the 49 new tools in this edition? 37 new NSE Scripts, covering SNMP, SSL, Postgress, MySQL, HTTP, LDAP, NFS, DB2, AFS, and much more. Nmap developer Patrik Karlsson found a major remote vulnerability in Mac OS X, which allows access to files in the parent directory of an AFS share. He wrote a detection/exploitation NSE script, which you'll find in this release. An alpha test version of our Nping packet generation utility. Zenmap host filter mode shows just the hosts you're interested in. For a more detailed list of changes, see the release notes. Source packages as well as binary installers for Linux, Windows, and Mac OS X are all available from the Nmap download page. After more than 18 months of work since the 4.50 release, Insecure.Org is pleased to announce the immediate, free availability of the Nmap Security Scanner version 5.00 from https://nmap.org. With nearly 600 significant changes, we consider this the most important Nmap release since 1997 and we recommend that all current users upgrade! The release notes provide the top 5 improvements in Nmap 5 as well as example runs and screen shots. The change details section includes improvements to the Nmap Scripting Engine, Zenmap GUI and Results Viewer, the new Ncat tool, the new Ndiff scan comparison tool, performance improvements, the new Nmap book, and much more! Source packages as well as binary installers for Linux, Windows, and Mac OS X are all available from the Nmap download page. Update: We've gotten some great press from ITWire, Slashdot, SecurityFocus, LoveMyTool, Reddit, Linux Weekly News, InternetNews.Com, Twitter, and dozens more. 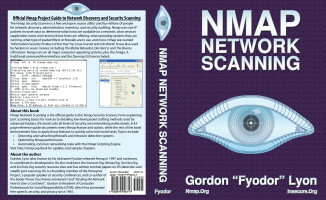 From explaining port scanning basics for novices to detailing low-level packet crafting methods used by advanced hackers, this book by Nmap's original author suits all levels of security and networking professionals. The reference guide documents every Nmap feature and option, while the remainder demonstrates how to apply them to quickly solve real-world tasks. Examples and diagrams show actual communication on the wire. Topics include subverting firewalls and intrusion detection systems, optimizing Nmap performance, and automating common networking tasks with the Nmap Scripting Engine. Visit the NNS web site for a detailed summary, reviews, and sample chapters, or buy it now from Amazon. The Conficker worm is receiving a lot of attention because of its vast scale (millions of machines infected) and advanced update mechanisms. 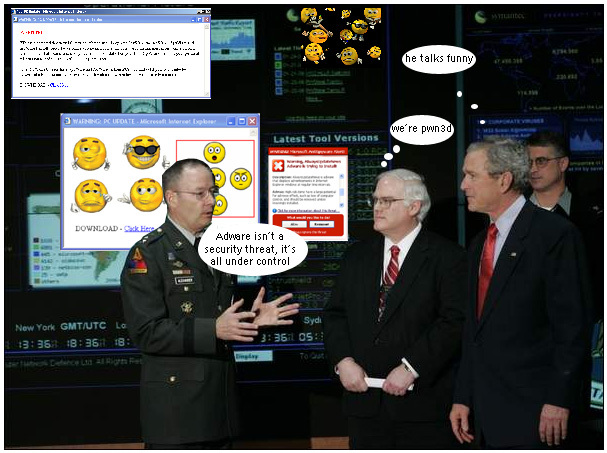 Conficker isn't the end of the Internet (despite some of that hype), but it is a huge nuisance we can all help to clean up. You will only see Conficker-related output if either port 139 or 445 are open on a host. A clean machine reports at the bottom: “Conficker: Likely CLEAN”, while likely infected machines say: “Conficker: Likely INFECTED”. For more advice, see this nmap-dev post by Brandon Enright. While Conficker gets all the attention, 4.85BETA7 also has many other great improvements. Update: Changed version from 4.85BETA5 (first to detect Conficker) to 4.85BETA7, which includes further Conficker detection improvements, among other changes. More information is available from: The Register, Slashdot, Washington Post, SecurityFocus, CNet, SC Magazine, ComputerWorld, SkullSecurity (Ron Bowes), Beta News, PC World, eWeek, CRN.com, TechNewsWorld, DarkReading, ComputerWeekly, PC Magazine, Threat Post, ZDNet. Fyodor spent much of this summer scanning tens of millions of IPs on the Internet (plus collecting data contributed by some enterprises) to determine the most commonly open ports. 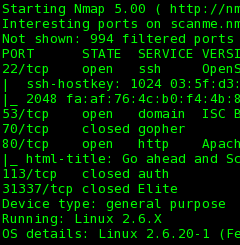 Nmap now uses that empirical data to scan more effectively. 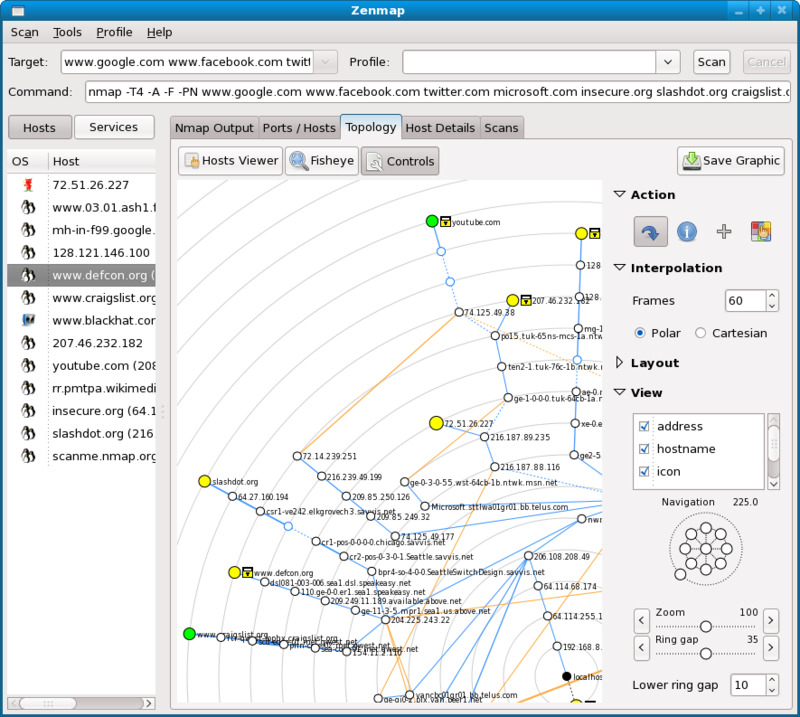 Zenmap Topology and Aggregation features were added, as discussed in the next news item. Hundreds of OS detection signatures were added, bringing the total to 1,503. Seven new Nmap Scripting Engine (NSE) scripts were added. These automate routing AS number lookups, “Kaminsky” DNS bug vulnerability checking, brute force POP3 authentication cracking, SNMP querying and brute forcing, and whois lookups against target IP space. Many valuable libraries were added as well. Many performance improvements and bug fixes were implemented. 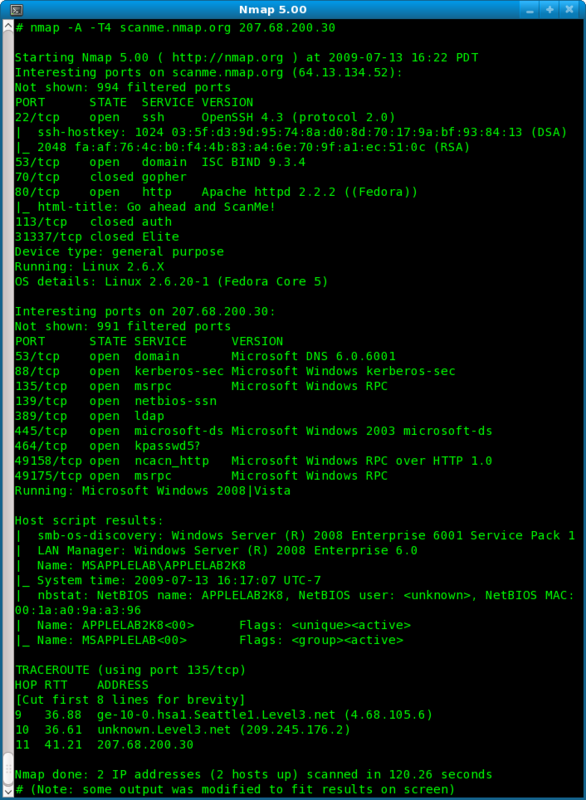 In particular, Nmap now works again on Windows 2000. Many of these changes were discussed in Fyodor's Black Hat and Defcon presentations. The audio and video has now been posted on the presentations page. 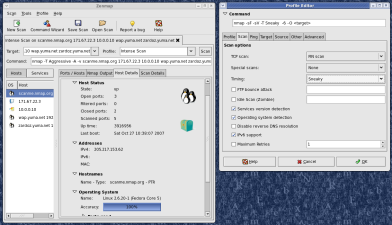 Download the source tarball or binaries for Linux, Windows, or Mac OS X from the Nmap download page. If you find any bugs, please report them. While Nmap stands for “Network Mapper”, it hasn't been able to actually draw you a map of the network—until now! The new Zenmap Network Topology feature provides an interactive, animated visualization of the hosts on a network and connections between them. The scan source is (initially) in the center, with other hosts on a series of concentric circles which represent the number of hops away they are from the souce. Nodes are connected by lines representing discovered paths between them. Read the full details (and oogle the pretty pictures) in our article on Surfing the Network Topology. Special thanks go to João Medeiros, David Fifield, and Vladimir Mitrovic for their tireless work in developing and integrating this new feature. Another exciting new Zenmap feature is scan aggregation, which allows you to combine the results of many Nmap scans into one view. When one scan is finished, you may start another in the same window. Results of the new scan are seamlessly merged into one view. You can try these and many other great features with the latest version of Zenmap, available from the Nmap download page. Fyodor spoke in Las Vegas at the Black Hat Briefings and Defcon to discuss the results of large-scale Internet scans he has been conducting, and demonstrate how you can use the empirical data to make your scans (over the Internet or even internal) more efficient. He also showed off some new Nmap features which can help you bypass firewall restrictions, reduce scan times, and gather more information about remote hosts. The presentation video is now available on the presentations page. RSS feeds for mailing lists archived by SecLists.Org now sport message excerpts to make it easier to identify interesting messages. We now have a working search engine which covers all of our sites (Insecure.Org, Nmap.Org, SecLists.Org, and SecTools.Org. You can find the search bar on the left sidebar or bottom of our normal pages, or visit our search page directly. 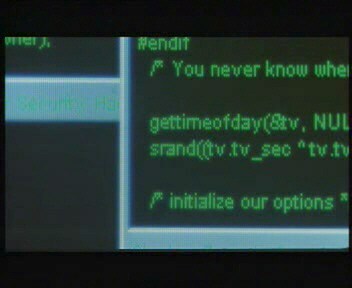 And for a bit of fun news, Nmap's movie stardom has grown with an appearance in its seventh movie! After nearly two years of work since the 4.00 release, Insecure.Org is pleased to announce the immediate, free availability of the Nmap Security Scanner version 4.50 from https://nmap.org . Nmap was first released in 1997, so this release celebrates our 10th anniversary! Major new features since 4.00 include the Zenmap cross-platform GUI, 2nd Generation OS Detection, the Nmap Scripting Engine, a rewritten host discovery system, performance optimization, advanced traceroute functionality, TCP and IP options support, and nearly 1,500 new version detection signatures. Dozens of other important changes—and future plans for Nmap—are listed in the release announcement. We recommend that all current Nmap users upgrade. Update: Joe Barr at Linux.Com has written a great review of Nmap 4.50. In addition to testing the new features, he offers substantial background information on port scanning. 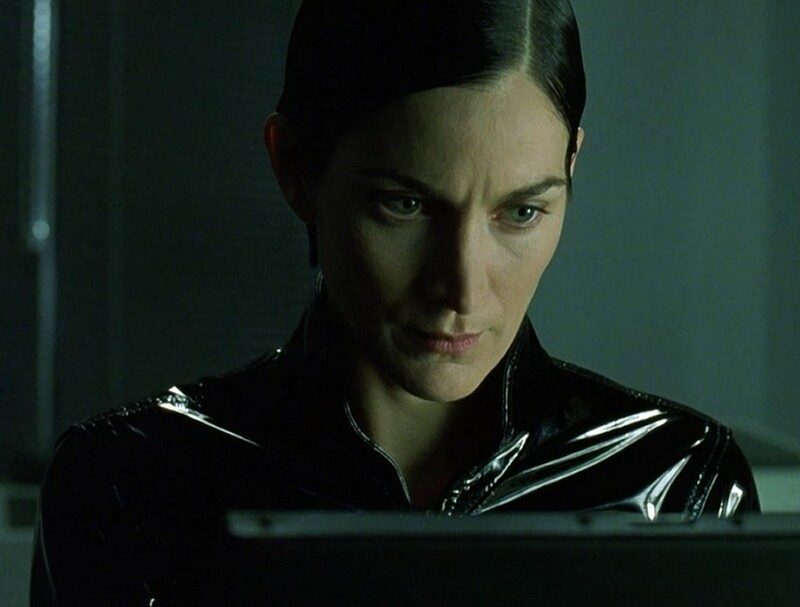 Other movies which have used Nmap include: Matrix Reloaded, Bourne Ultimatum, 13: Game of Death, Battle Royale, The Listening, and, uhh, HaXXXor: No Longer Floppy. 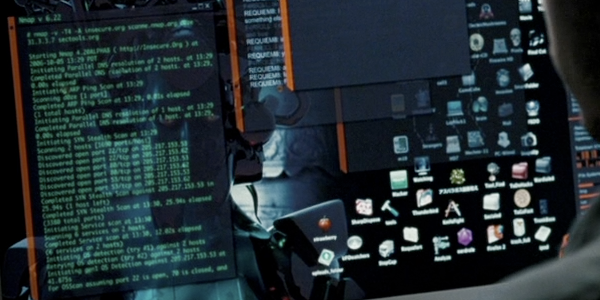 Screens shots of Nmap in all of these movies are available on our new Nmap movies page. 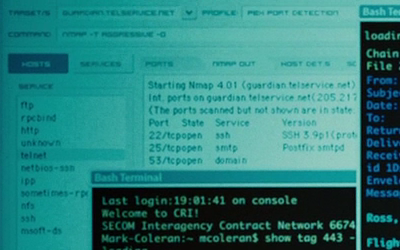 Nmap has become quite the movie star! After more than two years of development (starting with a 2005 Google Summer of Code project), we have replaced the venerable but dated NmapFE with a new cross-platform GUI named Zenmap. It is cross platform (tested on Linux, Windows, Mac OS X) and supports all Nmap options. Its results viewer allows easier browsing, searching, sorting, and saving of Nmap results. Zenmap will appear in the upcoming 4.50 release and is already available in the release candidate packages on the Nmap download page. 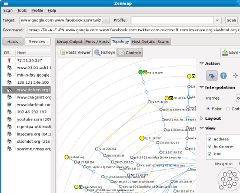 Zenmap screenshots and documentation are available at https://nmap.org/zenmap. Zenmap is still under active development, but was integrated early because it is already much more powerful than NmapFE. Development is coordinated on the nmap-dev mailing list. Thanks to Andrew Hake for catching the cameo and sending these HD screen shots. 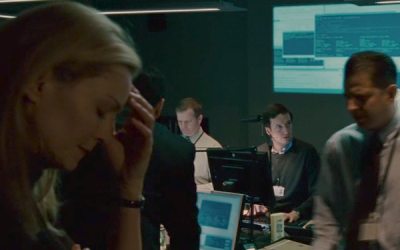 See our Nmap movies page for many more movies featuring Nmap. 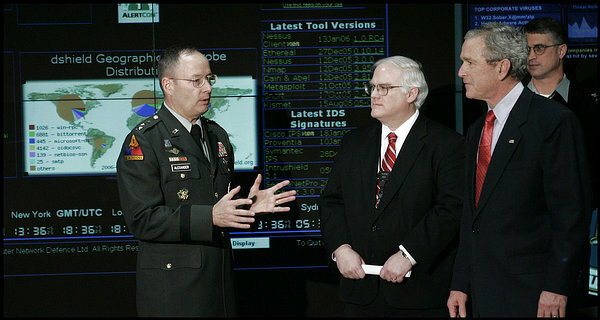 After the tremendously successful 2000 and 2003 top security tools surveys, we are pleased to release our 2006 results at a brand new site: SecTools.Org. A record 3,243 Nmap users responded this year. Notable trends since 2003 include the rise in exploitation frameworks such as Metasploit, Impact, and Canvas; the increased popularity of wireless tools such as Kismet and Aircrack. 44 tools are new to the list. Security practitioners are encouraged to read the list and investigate tools they aren't familiar with. You may find the little gem that you never knew you needed. Our popular SecLists.Org public mailing list archive is back up and running after it was inexcusably shut down with no notice by our soon-to-be-former domain registrar GoDaddy at the behest of MySpace.Com. We believe web site content is the responsibility of the site owner (registrant) and (if that fails) hosting or bandwidth provider. If the whois contact data is valid, registrars shouldn't be involved without a court order. Update: We have launched NoDaddy.Com to document GoDaddy's abuses of their registrar status. After two years of work since the 3.50 release, Insecure.Org is pleased to announce the immediate, free availability of the Nmap Security Scanner version 4.00 from https://nmap.org . Changes since version 3.50 include a rewritten (for speed and memory efficiency) port scanning engine, ARP scanning, a brand new man page and install guide, 'l33t ASCII art, runtime interaction, massive version detection improvements, MAC address spoofing, increased Windows performance, 500 new OS detection fingerprints, and completion time estimates. Dozens of other important changes -- and future plans for Nmap -- are listed in the release announcement. RSS feeds have been added to all security mailing lists archived at SecLists.Org, making it even easier to keep up with the latest news from Nmap-Hackers, Nmap-Dev, Bugtraq, and all of the others. We have also added Dailydave, a highly technical discussion list covers vulnerability research, exploit development, and security events/gossip (with many smart people participating). We are proud to announce that the Nmap man page has been completely rewritten. It is more comprehensive (double the length) and much better organized than the previous one. It is meant to serve as a quick-reference to virtually all Nmap command-line arguments, but you can learn even more about Nmap by reading it straight through. The 18 sections include Brief Options Summary, Firewall/IDS Evasion and Spoofing, Timing and Performance, Port Scanning Techniques, Usage Examples , and much more. It even documents some cool features that are slated for release in the next Nmap version (runtime interaction and parallel DNS resolution). The new man page is best read in HTML format, though you can alternatively download the Nroff nmap.1 to install on your system. We have issued a call for translations of the reference guide, and 29 languages are in progress. See the new documentation page to volunteer or read a translation. Fyodor has co-authored a novel on hacking, along with FX, Joe Grand, Kevin Mitnick, Ryan Russell, Jay Beale, and several others. Their individual stories combine to describe a massive electronic financial heist. While the work is fiction, hacks are described in depth using real technology such as Nmap, Hping2, OpenSSL, etc. Stealing the Network: How to Own a Continent can be purchased at Amazon (save $17), and your can read Fyodor's chapter online for free. STC was a best-seller, ranking for a while as the second-highest selling computer book on Amazon. Update: Syngress has released a sequel: Stealing the Network: How to Own an Identity. They have generously allowed Fyodor to post his favorite chapter for free. So enjoy Bl@ckTo\/\/3r, by Nmap contributor Brian Hatch. It is full of wry humor and creative security conundrums to keep the experts entertained, while it also offers security lessons on the finer points of SSH, SSL, and X Windows authentication and encryption. After several months of intense private development, we are pleased to release Nmap 3.45, including an advanced version detection system. Now instead of using a simple nmap-services table lookup to determine a port's likely purpose, Nmap will (if asked) interrogate that TCP or UDP port to determine what service is really listening. In many cases it can determine the application name and version number as well. Obstacles like SSL encryption and Sun RPC are no threat, as Nmap can connect using OpenSSL (if available) as well as utilizing Nmap's RPC bruteforcer. IPv6 is also supported. You can read our new version detection paper for the details and examples, or just download the latest version and try it out here. Simply add "-sV" to your normal scan command-line options. News articles covering Nmap version detection: Slashdot, Hacking Linux Exposed, Security Wire Digest. 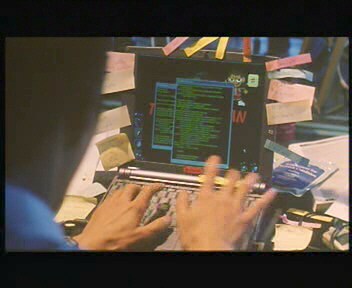 We have all seen many movies like Hackers which pass off ridiculous 3D animated eye-candy scenes as hacking. So I was shocked to find that Trinity does it properly in The Matrix Reloaded [Under $6 at Amazon]. 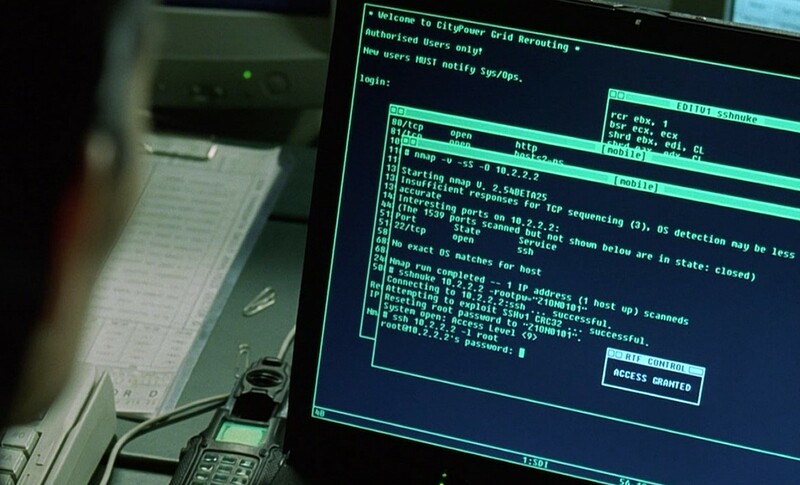 She whips out Nmap version 2.54BETA25, uses it to find a vulnerable SSH server, and then proceeds to exploit it using the SSH1 CRC32 exploit from 2001. Shame on them for being vulnerable (timing notes). Congratulations to everyone who has helped make Nmap successful! Click on these thumbnails for higher resolution or view more pictures here. JWZ has added this cracking scene as an XScreenSaver 4.10 Easter Egg - run 'xmatrix -small -crack'. Several people have submitted matrix-themed banners to the propaganda gallery. Feel free to use any of these to link to Insecure.org - we appreciate it! 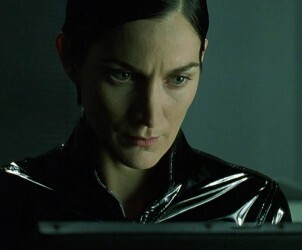 The UK's Scotland Yard Computer Crime Unit and the British Computer Society have put out a joint warning that "Viewers of the new box office blockbuster 'Matrix Reloaded' should not be tempted to emulate the realistic depiction of computer hacking." Kids - don't try this at home!